At the heart of a wine estate along the Duero River, Le Domaine Abadia Retuerta is a true jewel. Built within an 12th Century old abbey, the site is one of the only abbeys to have survived the wave of destruction during the Napoleonic years and is today a Spanish cultural heritage site. The abbey and monasteries have a unique Baroque-Romanesque style, as well as a classic Benedictine layout. This 5* luxurious hotel offers a wide range of top-quality services in a truly breath-taking setting. The Abadia Retuerta is located just outside the town of Valladolid in central northern Spain, in the Castilla y Leon province. Due to its perfect location on the banks of the Duero River, it is the ideal base to explore the Ribera del Duero wine region. An approximately two hours’ drive can take you to the Rioja wine region. Madrid can be reached in just over two hours and Bilbao is around three hours away from the hotel. 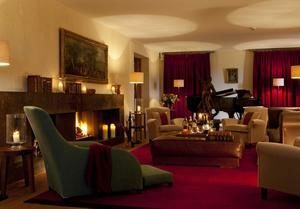 The Domaine offers all the premium facilities you would expect from a 5* hotel. The Michelin-starred Refectorio restaurant proposes a good range of delicious dishes perfectly combining tradition and creativity. Guests can also enjoy tapas dishes at the Vinoteca restaurant. During the summer season, an outdoor terrace and bar are open for guests to make the most of the lovely weather. 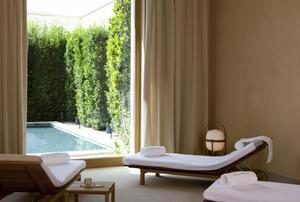 The spa, with its good range of treatments is ideal to enjoy a very relaxing stay. 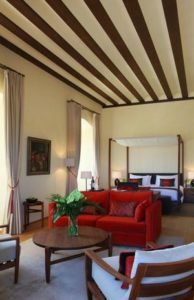 The Abadia Retuerta welcomes guests in 27 rooms and 3 Suites, carefully renovated in a contemporary style. They offer all the modern comforts and have charming views over the surrounding vineyards. They all have Satellite TV, complimentary WI-FI, climate control, a safe and a minibar as well as en-suite bathrooms with toiletries, bathrobes, slippers and hairdryers. Different room grades include Classic rooms, Superior rooms, Junior Suite, Two-Bedroom Suite and Master Suite.